Years ago, I used to consider my pantry pretty well-stocked. Overflowing with bottled sauces, vinegars, oils, all sorts of things dried, pickled and salted, pastas, rices, spices and various assorted kitchen sundries, I assumed that as long as I kept collecting, some day I would have everything, and exotic dishes could be whipped up at the drop of a hat. Sicilian sun-dried tomato paste? Got it. Hawaiian red rock salt? Ditto. Pistachio extract and cocoa nibs? Four kinds of dried mushrooms, six kinds of vinegar, and eleven different types of bouillon cubes? I think you get the point. What I hadn’t taken into the equation was just how much more I would need when I started experimenting with Asian food. In the blink of an eye, my pantry was looking very bare indeed. Asian cooking – and by this I’m specifically referring to Southeast Asian, Chinese and Japanese – was uncharted territory in my kitchen for a long time. Although I’ve always loved eating it, cooking it was something I used to happily leave to the experts, and as long as I was living in places where ethnic restaurants were good and affordable, that seemed a perfectly reasonable thing to do. Another good reason for this was that Asian food always took me outside my ‘culinary comfort zone’ whenever I tried to do it myself. The recipes, in addition to requiring hard-to-find ingredients with strange names, contained confusing abbreviated instructions for things I had no idea how to do: exactly how does one grind rock-hard things to a paste, or steam things in a multi-tiered steamer? Yet whenever I attempted simpler (and obviously ‘Westernized’) versions they never tasted authentic. It wasn’t until I moved to Edinburgh and its lack of authentic Asian restaurants that I realized it was imperative that I track down the right ingredients and master the unfamiliar cooking techniques, or else I would have to bid farewell to some of my most favorite food on the planet. Thankfully, due in no small part to a five-year old craving for a bowl of laksa, I decided to give it my best shot. I first tasted laksa in Australia, of all places, at a wonderful Malaysian restaurant in Melbourne. Straddling the line between a curry and a soup, it’s really the best of many different Asian traditions and is always a deeply, bottom-of-the-belly satisfying one-bowl meal. It’s a popular street food all over southeast Asia, but particularly in Malaysia and Singapore, where it grew out of a fusion of Chinese and tropical Asian ingredients and techniques. And if you’re interested in the name, as the linguist in me always is, it apparently comes from the Sanskrit ‘laksha’, which means ‘many’, obviously referring to the profusion of ingredients in (if not versions of) the dish. There are, I’m told, as many versions for Laksa as there are cooks in Southeast Asia, but there are some broad commonalities based on region. Laksa lemak, perhaps the most well known and also known as nonya laksa, is a type of laksa served in a rich, slightly sweet and strongly spiced coconut gravy, and usually features cockles or prawns and a variety of toppings like bean sprouts, fresh herbs, tofu and cucumber. Katong laksa is a variant of laksa lemak from the Katong area of Singapore. Here the noodles are normally cut up into smaller pieces so that the entire dish can be eaten with a spoon alone (that is, without chopsticks or a fork). Penang laksa, also known as asam laksa (from the Malay for tamarind), comes from the Malaysian island of Penang and has a sour tamarind flavor as its main distinguishing feature. 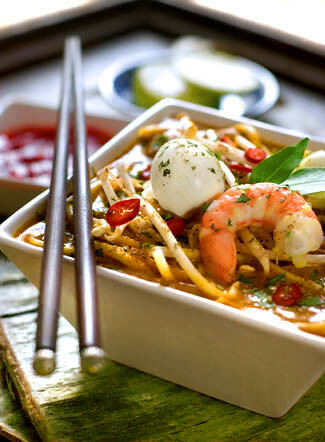 Other ingredients that give Penang laksa its distinctiveness include lemongrass, ginger flower, blue ginger (lengkuas) and chilli, and typical garnishes include mint, pineapple slices, thinly sliced onion and a thick sweet prawn ketchup. Finally, Sarawak laksa comes from the town of Kuching in Sarawak, on the Malaysian island of Borneo. It has a base of shrimp paste, sour tamarind, garlic, lemon grass and coconut milk; toppings include beansprouts, omelette strips, chicken strips, prawns, fresh coriander and optionally lime. The only difficulty I had, considering the myriad types of laksa out there, was to find a recipe that looked both authentic and do-able. There are of course as many recipes you could care to find floating in the wilds of the internet, but I had three in my possession I was determined to use. Two of those are in recently acquired (and very highly recommended) cookbooks, Shiok! by Chris and Terry Tan and Tropical Asian Cooking by Wendy Hutton (and both, I might add, exquisitely photographed by Singapore-based photographers Edmond Ho and Masano Kawana). There was also a recipe Tara sent me from the The Best cookbook which corresponded to their cook-off of Asian noodle dishes I had seen a few years ago on television. After scrutinizing all three for their strengths and weaknesses and worrying about which was the most authentic, I gave up and decided to attempt a fusion of all of them, based on what I could find and what looked good. After trolling the supermarket shelves for several weeks and making a trek into lesser-known parts of the city in search of a rumored Asian supermarket, I finally found everything I needed (and my already-bloated pantry had swollen by yet another size or two). The laksa that resulted was definitely worth the wait. Crunchy, creamy, slurpy and spicy, it was the perfect antidote to the tasteless westernized Asian food I’ve been suffering for years. I can’t really vouch for its authenticity, but considering the dissenting opinions on that anyway, I’m not going to worry too much – to my long-starved tastebuds, at least, it was perfect. In fact, next to the Sicilian tomato paste, Hawaiian salt and six kinds of vinegar, you’ll now find a section of my bursting pantry devoted to all sorts of things like fermented shrimp paste, sambal olek and Vietnamese rice-stick noodles, ready and waiting for the next Asian-food adventure. This may never be ‘comfort-zone’ cooking for me, but if the results are anything near as good as that laksa, I’ll soon be renting out a storage locker for the inevitable pantry overflow. Process the first 6 ingredients together in a food processor to a coarse paste. Heat the oil, add the paste, and fry over medium heat until the moisture has dried up and the paste is deeply fragrant, about 15 minutes. Raise the heat and add the chili, turmeric and coriander powders; fry 1 minute. Add the shrimp paste and ground shrimp and fry for another 2 minutes. Stir in the coconut milk, chicken stock, salt and sugar, and bring to a boil. Lower the heat and boil gently for about 20 minutes, until slightly thickened. Season to taste and keep warm. Heat the vegetable oil in a frying pan and fry the sliced garlic, and separately fry the shallots and chilies for about 30 seconds until crispy and golden brown. Strain and cool. Pound together in a pestle and mortar with the salt and the sugar. Reserve. Divide the hot drained noodles between four serving bowls. Top with the chicken, shrimp, eggs, and sauce. Scatter with the garlic, shallot and chili mix, beansprouts and coriander. Serve with the limes and sambal. *To toast shrimp paste, spread it on a piece of foil and put it under a hot broiler or grill for a couple of minures. I’ve been hearing marvelous things about laksa for a while now but have never actually tasted the stuff–a sad fact, given my love for galangal and lemongrass and chiles and coconut milk! Melissa, my dear, I think my time has come. Thank you. I feel the same way when tackling cuisines other than my own, those beyond “my comfort zone”. I am still trying to perfect pad thai.Even though I am Southeast Asian, I am as much in the dark when it comes to cooking anything other than Indian as you are. Luckily I have the aisles of the local Korean store for browsing, unfortunately I am usually lost after being confronted by 200 different types of soy sauce!! yum! I cant believe you fought that craving for 5 years, thats some kind of willpower.. But Im glad you finally gave it a go, even if you no longer have any room in your pantry. I am also one who has a ton of ingredients laying about, but its such a nice feeling to spot an exotic recipe and have most of it on hand. Although I still have to find a source for all these ingredients in Paris, they must be hiding somewhere! What a stunning photograph, a gorgeous still-life in itself! Not to discount the great recipe – I love the balance of flavours in a good Laska. It is perfect that you’ve already taken the time to fuse the mentioned recipes together, saves us from doing the same! I had been planning the one from the Best, but yours sounds miles tastier. A perfect TV dinner, no? Slurped up from a big bowl, nothing could be more welcomed this time of year. Great post and yummy looking photo. I’ve emailed Chris Tan and Edmund Ho of Shiok! to check out your post. Hopefully, they’ll pop by. Glad that you made laksa lemak also. I much prefer that to Penang/assam laksa. laksa is my one of my favourites. being born and bred in singapore, its in my blood. just a little tale about the madness of laksa cravings. 2 weeks ago i had one of my wisdom teeth surgically removed.and i was supposed to go on an easy soft diet for at least five days. granted. i made a really delicious pumpkin soup the first day, but eating was so painful and took so long that by the time i was done with the bread and soup i was hungry again. totally miserable. the next day, on my way home, in so much pain and so high on all the medication, i suddenly smelt laksa in my brain. i did not care whether it was nonya, katong or lemak. i just needed to feel the rich spicy creaminess sliding down my throat, the calm richness of flavours on my furry tongue. so i went to the foodcourt on the way home. granted, it was not fantastic, but still respectable. took me a half hour to slowly eat my way through. but the most satisfying bowl of laksa i’ve had in a long time. Dear MelissaThis looks heavenly. You make me feel guilty for not enjoying this dish more often. Hi Melissa,I have to give you credit for making this. I’ve made it before and won’t ever do it again. Too much work involved. BUT the taste is so remarkable, isn’t it?You’ve done a wonderful job on the presentation! Hi AG – Oh, I had some pretty memorable food in Australia! What I remember most fondly, actually, was walking around Sydney and being able to buy a maki roll as big as my hand whenever the urge struck (for about a dollar!). Hope you realize how lucky you are!Hi Clare – Hey thanks for the book recommendation, it looks really good! This is one section of my library that could do with a little expanding, not that I need any excuse to buy a cookbook ;)Hi Molly – A laksa virgin, eh? Well see, there’s no excuse anymore – a recipe has fallen into your lap! I was actually trying to remember if there are any good Malaysian/Singaporean restaurants in Seattle…you’d think with such a huge Asian community there should be. Do you know of any?Hi Anyesha – I know what you mean! I get inspired just by seeing all those exotic ingredients but it’s quite daunting to realize just how much is still unfamiliar to me. By the way, if you ever do perfect that Pad Thai, I’m in need of a good recipe myself :)Hi Michele – I’m sure they’re hiding somewhere, and finding them is the fun part, don’t you agree? I didn’t think I’d be able to find what I needed here, but a tipoff about a large Asian supermarket on the outskirts of town led me to a fantastic find – I saw things there I’d never seen before and came home with way more than I’d intended to…Hi Tara – Well I can actually thank you for setting the wheels in motion to attempt this. I hadn’t thought about laksa in a long time, but when you posted about ‘The Best’ I remembered that yummy-looking laksa Ben made, and the rest is history. Do give it a try and let me know what you think! And yes, don’t tell anyone but we ate it in front of the TV… Hi Johanna – Thank you! You got me chuckling about the mysterious cupboard finds, the same thing happens to me all the time. Just yesterday I found some candied Italian citron I have no memory of buying. Makes it kind of exciting every time I open the cupboard (not to mention the excitement from dodging the overflow that falls out every time the door is opened…) But great idea with the 75% rule – I’ll have to give that a try!Hi Santos – That must be one heck of a craving! Since I unfortunately wasn’t in the position to fly back to Australia for a bowl of laksa, I had to do my best to find a bowl closer to home – which ended up being at home. Enjoy your trip back – and eat an extra bowl for me ;)Hi Chubby Hubby – My goodness, thank you for your advertising efforts! I would be most honored if either Chris Tan or Edmond Ho stopped by to see my interpretation (or butchering?) of their beautiful recipe. Actually I bought Shiok! mostly thanks to you and J piquing my interest in Singaporean food, so there you go! p.s. Is there anyone you don’t know? Hi Denise – Fantastic story! I could have used a bowl of laksa when I had my wisdom teeth taken out (all four at once!) ten years ago. Unfortunately I only had applesauce, yogurt and mashed potatoes to ease the pain…Hi S – Oh dear, guilt was the last thing I intended to cause! Rather feel lucky that you can probably find a great laksa a few steps from your front door!Hi Reid – Thanks for your compliments! I didn’t actually think it was so much work, maybe a bit more than you average bowl of pasta but less than many things, especially since the shrimp and chicken were already cooked. If I had a good source for it, I probably wouldn’t bother making it myself, but until that happens, I’m happy to spend the time! Hi Melissa, I’m not sure if this is the best place for it, but I thought it might be helpful here for any other Melbournians looking for the laksa you describe. Your directions led me to a place called Chinta Ria Soul on Acland St in St Kilda – and the laksa really was great!!! Thanks again for the tip – I’ll be going back for sure! actually hard things are ‘poundable’. have you ever seen a stone bowl? it’s super hard. I used to see my mom pounding chillies and garlic with it. (not using the bowl to do it). normally, those stone bowls come with a small rod that’s made of stone too. (or granite?- something hard) usually, you pound chilli and garlic to make chilli paste. Thanks for the cookbook Shiok! suggestion and the lovely recipe. My parents are Singaporean and sorely miss the food (but we gorge ourselves on visits to relatives to make up for it). Just getting the ingredients in California can be tough, not to mention the mortar and pestling and chopping a gazillion things. I was defeated by a make-green-curry-from-scratch effort, but maybe I’ll try again. Please, please put up more awesome Southeast Asian recipes, even though it’s outside your comfort zone! I adore laksa and it is one of the dishes I miss most living in Europe. With hunting I can find half-decent chinese, bad vietnamese, but NO good Malaysian or Indonesian food. The rich, thick creamy, spicy goodness of a laksa is something I miss very much indeed. thanks for sharing this recipe. I like cooking, your article very much informative. There was also a recipe Tara sent me from the The Best cookbook which corresponded to their cook-off of Asian noodle dishes I had seen a few years ago on television.